A number of commentators identify this chapter as a prayer David composed after he seized King Shaul's spear and water jug in the wilderness of Zif. The narrative in the Book of the Shemuel I (chapter 26) tells that as Shaul and three thousand warriors pursued David in Zif, they encamped and went to sleep on a certain hill. David quietly approached the camp and seized Shaul's spear and jug which he later produced to demonstrate to Shaul that he had the opportunity to kill him but refrained. After this incident, which proved David's fidelity to Shaul, David composed this Psalm in which he condemns those who passed unfair judgment on him and perceived him as a threat to Shaul's kingship. 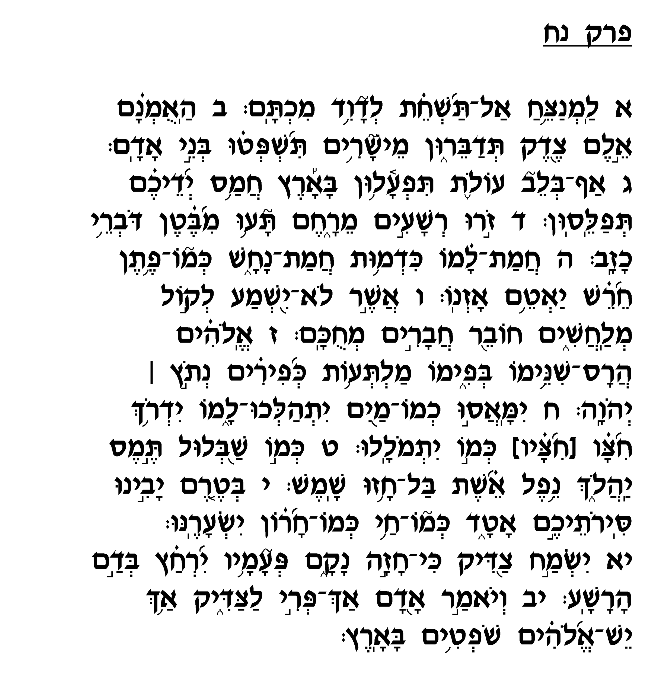 Some commentators claim that David refers here specifically to Avner, Shaul's general, and the other high-ranking officers who viewed David as a threat to their statures and positions, and therefore convinced Shaul of his disloyalty. David here ridicules their self-righteousness in passing judgment on him, casting false allegations solely to further their own egotistical goals (verse 2-3). In describing Shaul's officers David invokes the image of a poisonous snake that buries its ears in the ground so as not to hear the charms and incantations that were known to prevent snakes from biting (verses 5-6). Shaul's officers, too, close their ears and ignore the true facts about him, relentless and insistent in their efforts to demonize David in Shaul's eyes. David warns that God will "break their teeth" (verse 7), and see to it that the truth about his innocence will be manifest clearly and irrefutably. When that happens, David declares in this Psalm's final verse, the world will acknowledge God's justness and realize that the wicked are ultimately punished while the righteous are vindicated and rewarded.